I’ve wanted to do this post for ages and finally it’s here. 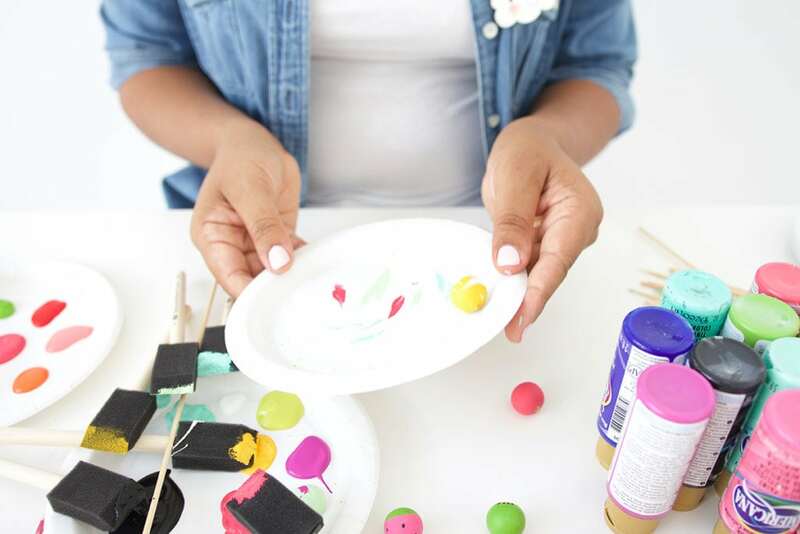 able crafts that you can make with basic supplies. I want you to actually make some of these crafts, afterall. 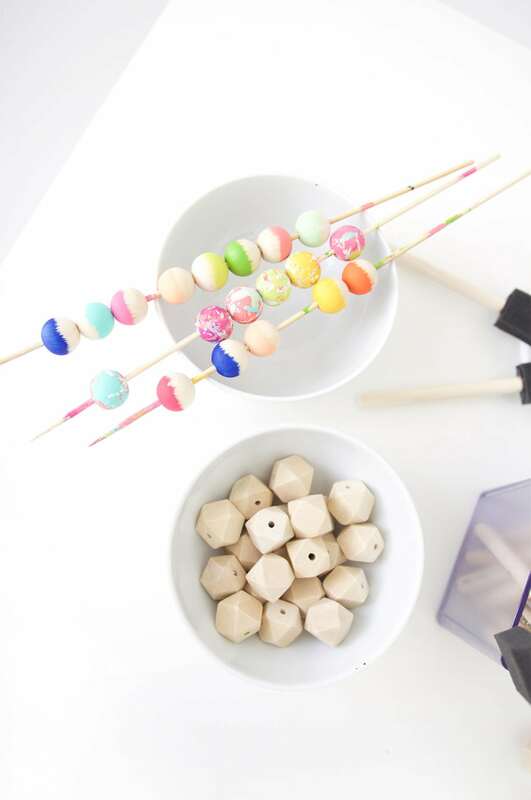 It doesn’t get much simpler than craft paint and wooden beads. 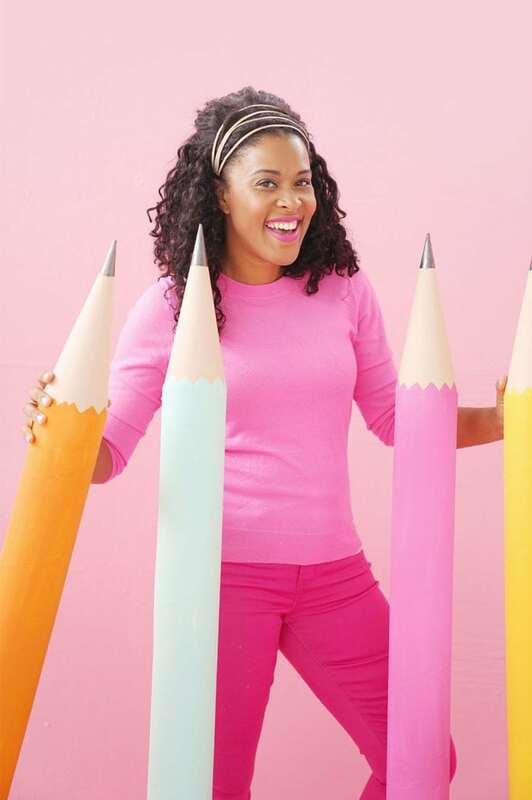 It’s sort of a throw back to being a kid in summer camp and making crafts for your mom that she pretended to love. 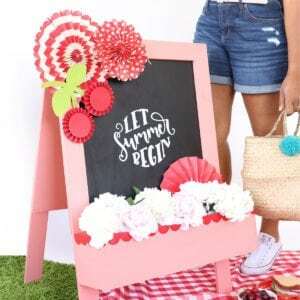 This summer camp craft is something you won’t need to pretend to love…you’re gonna love it. Promise. 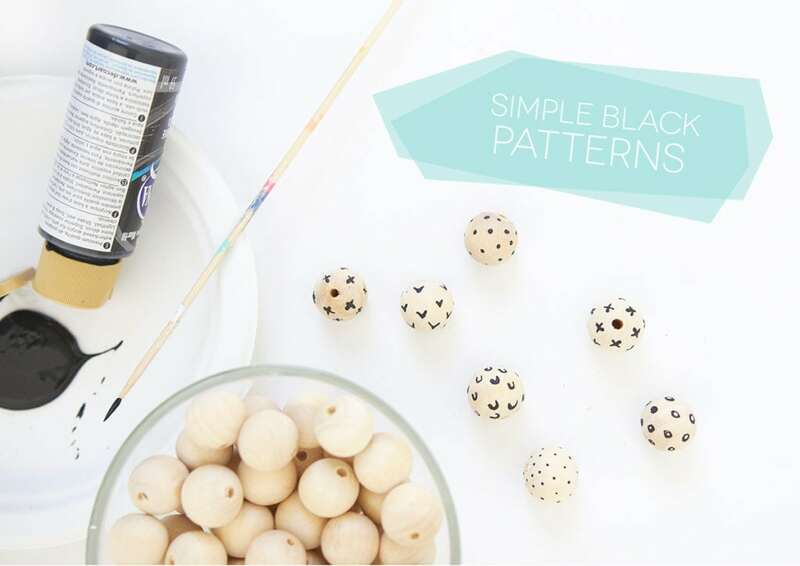 Welcome to Wood Beads 101 where I’m going to teach you exactly how to paint wooden beads in a bunch of different patterns and looks. Pull up a chair. Craft is in session. I can bet you have most of these supplies. If you don’t, you can grab them all in one trip to the craft store and you can probably get everything for less than $25. See – I told you this was a doable craft. Set out all of your supplies on a table so you have everything in reach. 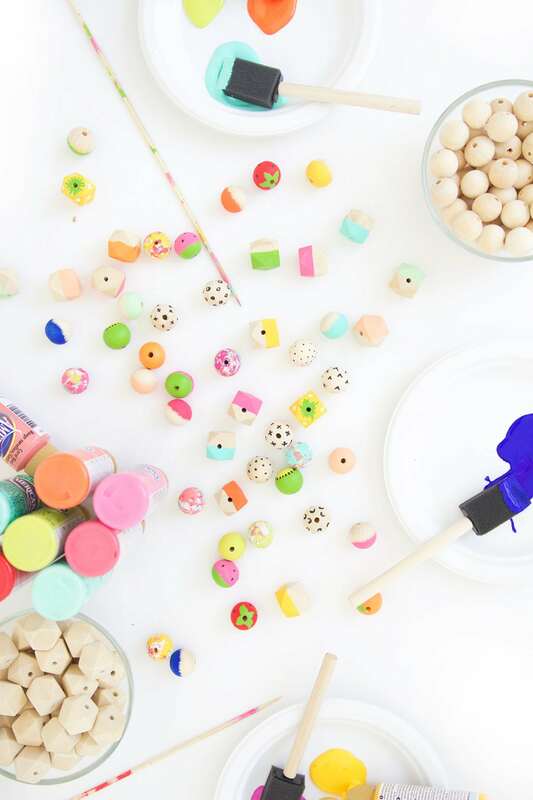 Once you learn how to paint wooden beads, it’s hard to stop. Turn on a movie and get comfy, you’re gonna be here a while. 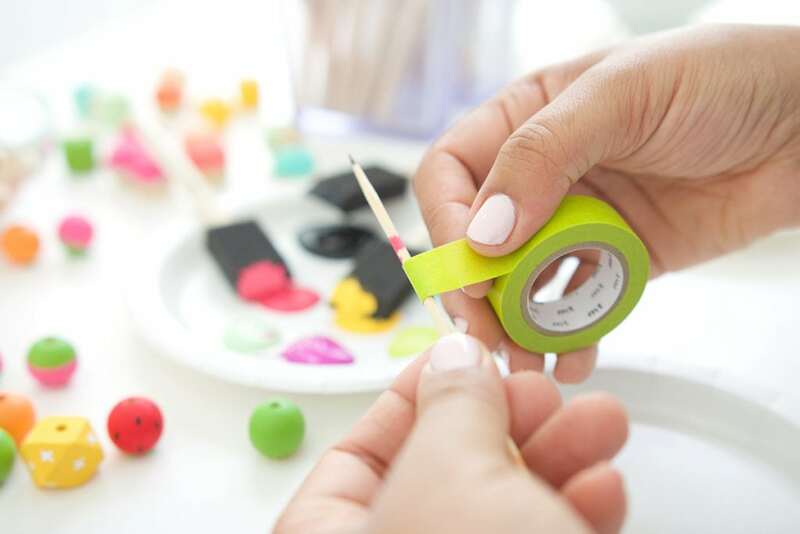 Wrap a skewer with some washi tape. This will keep the bead in place and make it easier to paint. You only need to wrap it a few times. 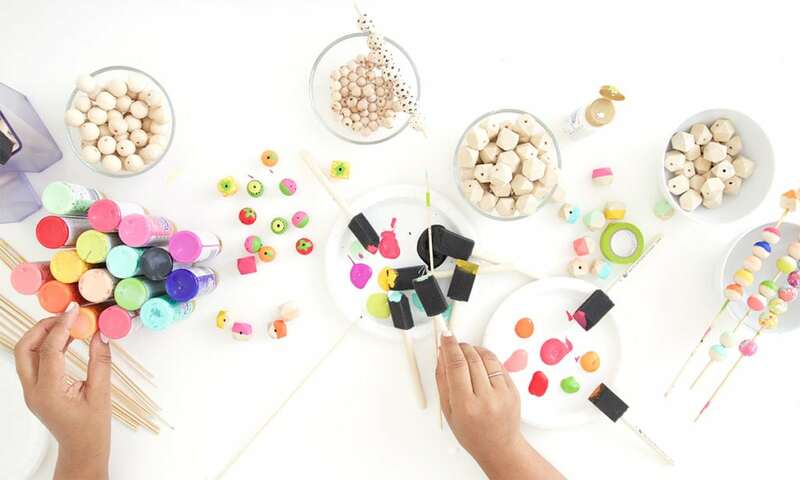 Now that you’ve got your supplies ready to go, let’s paint beads. 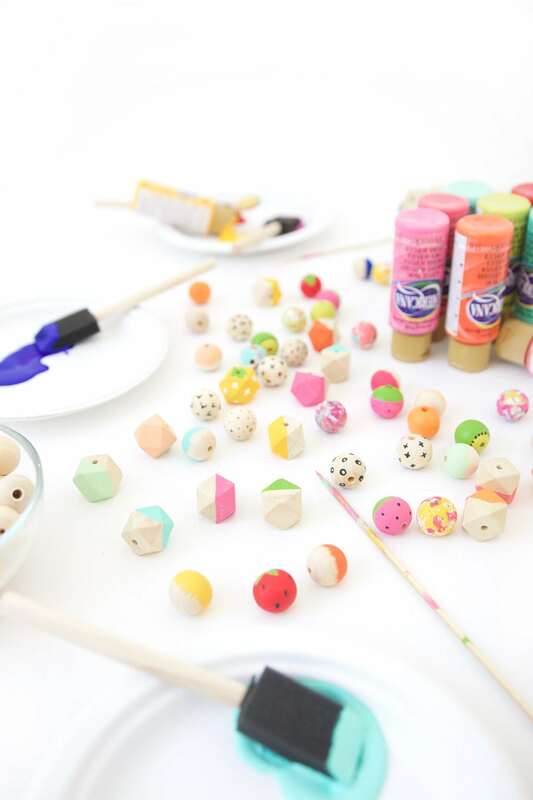 Here’s a tour through how to paint wooden beads in five beautiful ways. 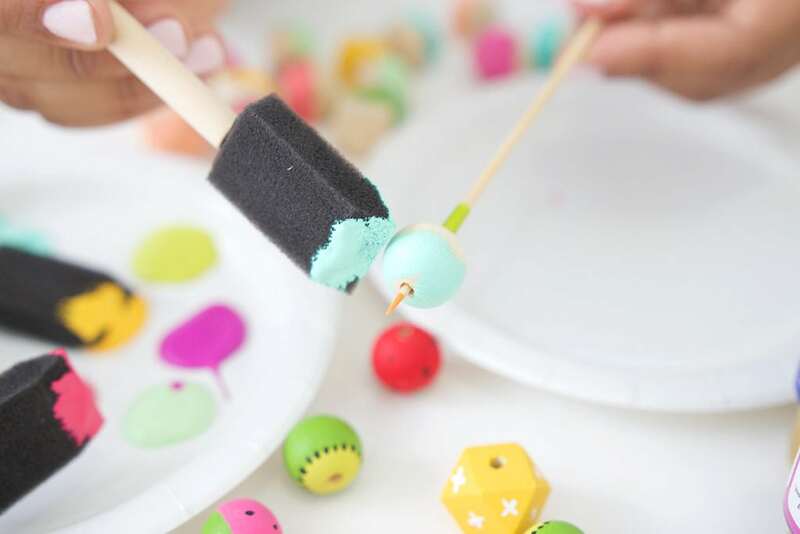 This is probably the easiest way to paint round beads. 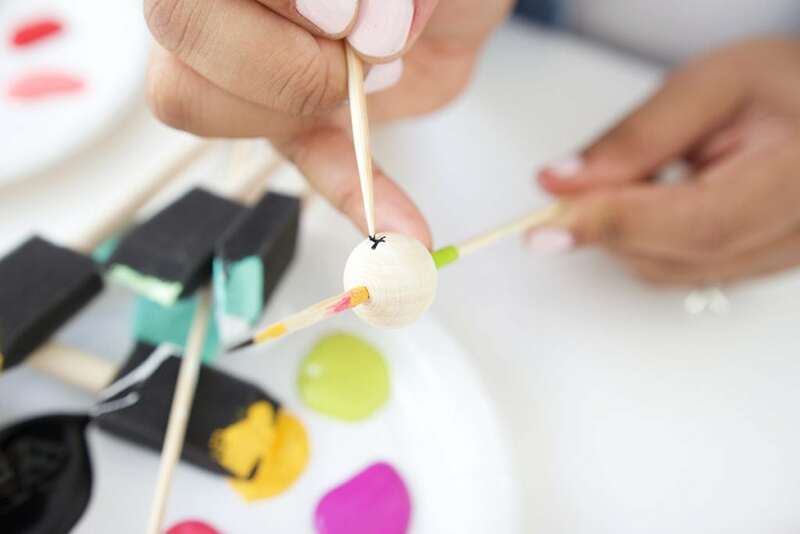 Just place the bead onto a skewer, load a teeny bit of paint onto your foam brush, then use quick downward motions to add paint to the bead. That’s it! This simple bead is my favorite! 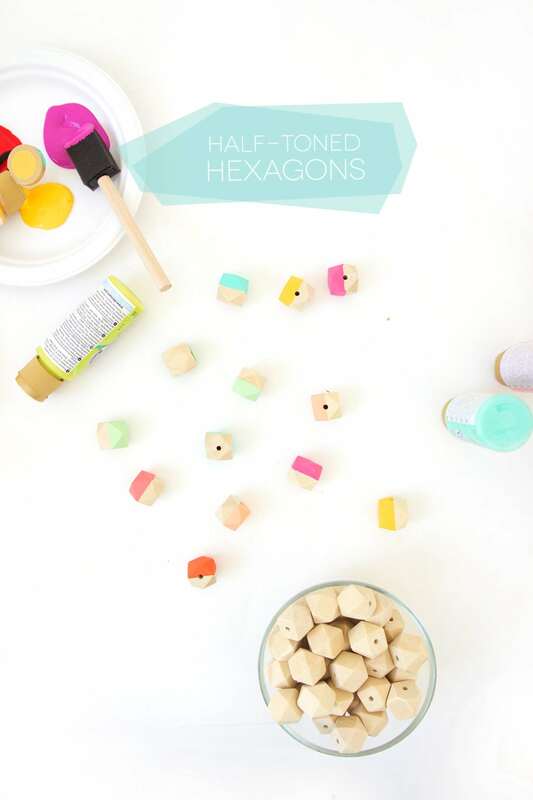 Use your foam brush to create a straight edge down the middle of each side of the bead. Then fill in any unpainted spots. Leave the other half of the bead unpainted. 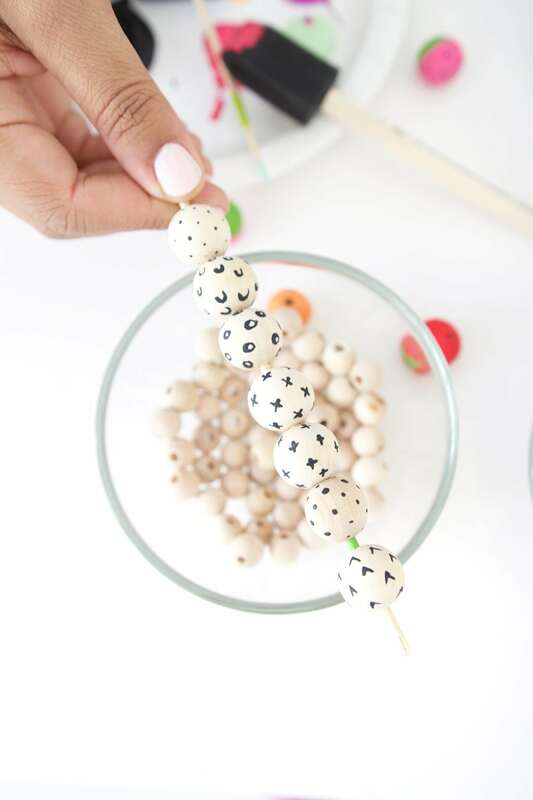 Dip the tip of the skewer into black paint and use it like a pen to “write” on each bead. 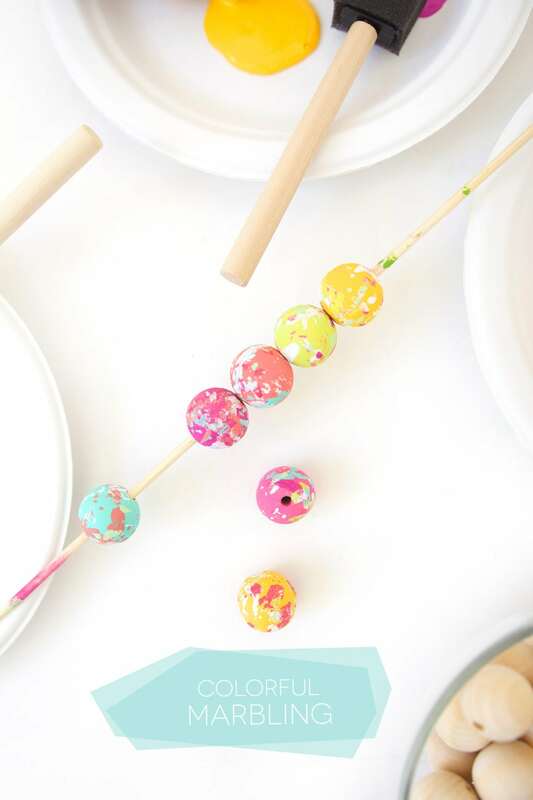 Keep dipping the skewer to get more paint and continue the pattern until the bead is covered. There’s no way to mess these up! First, paint the entire bead. 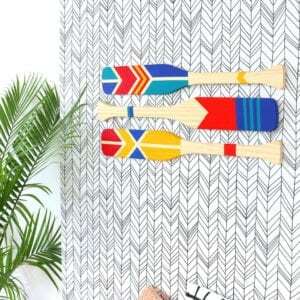 Next, place a few swashes of paint directly onto a paper plate. 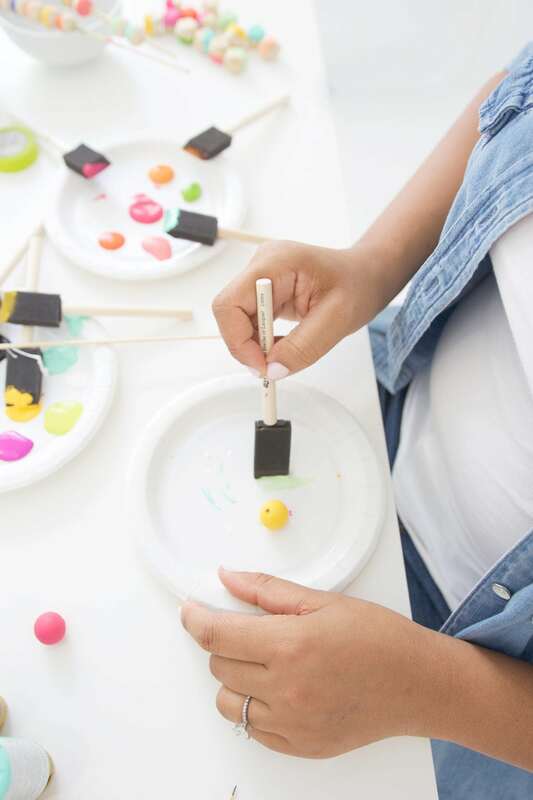 You don’t need much paint in the plate – just a few dabs and swipes. 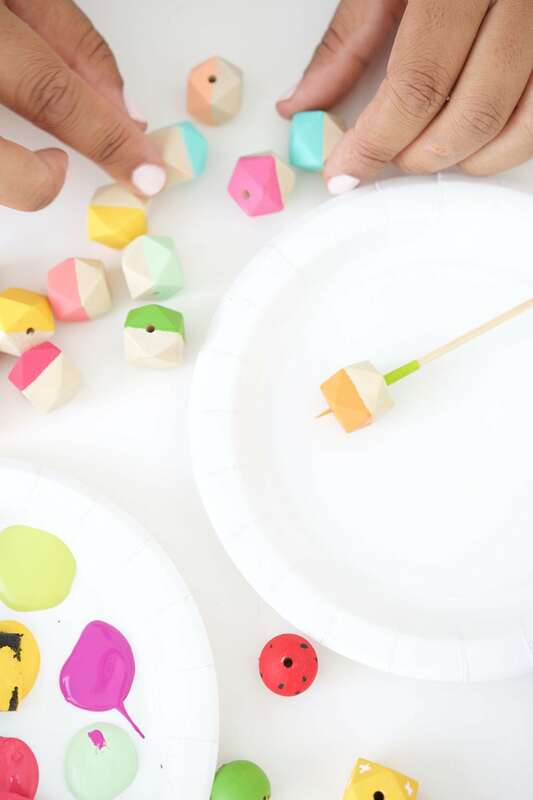 Place the painted bead into the plate and tilt the plate back and fourth until the wooden bead picks up some random ribbons of color. 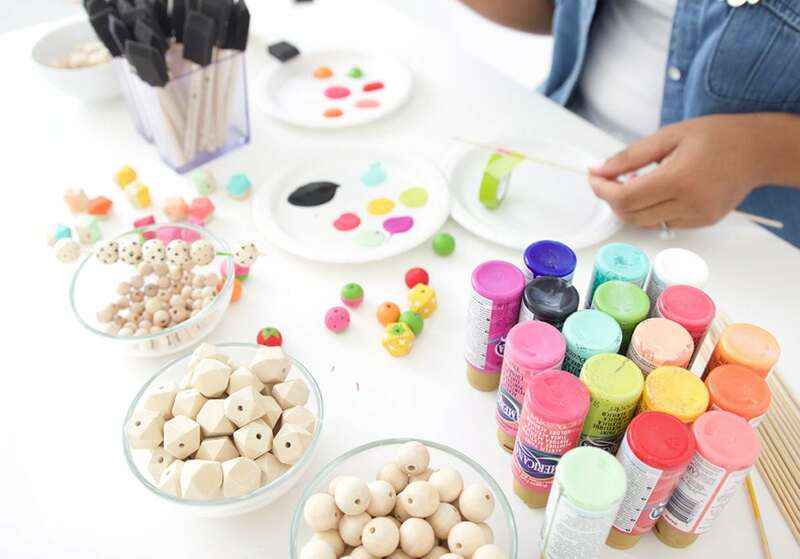 Now that you’ve learned how to paint wooden beads in all these different ways, you can combine the techniques to create fruity beads! Again use the skewer as a “pen” to add leaves leaves and seeds to the fruit. You can also use the “half-toned” technique to create two layers of color on the kiwi and watermelon. 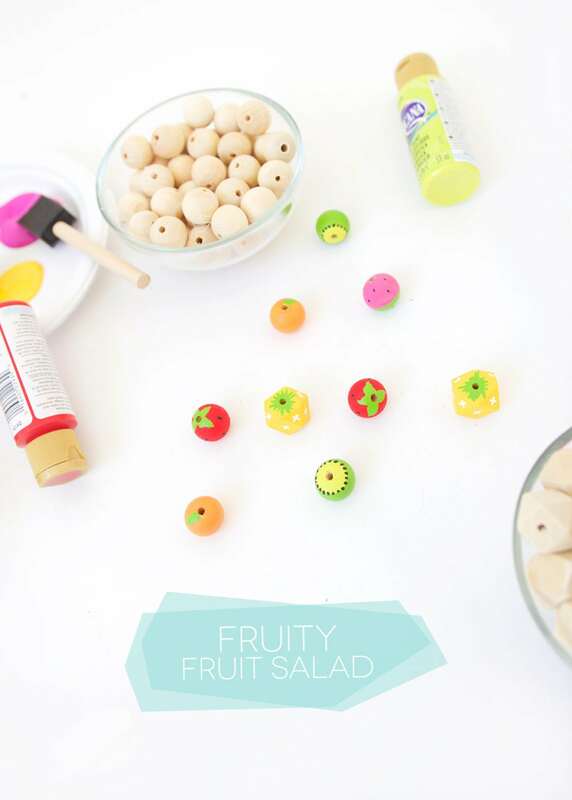 Have fun with these and see what other fruit you can create! Oh WOW!! 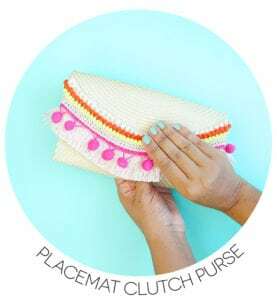 This is a great tutorial!! How cute are you?! And I love these beads. 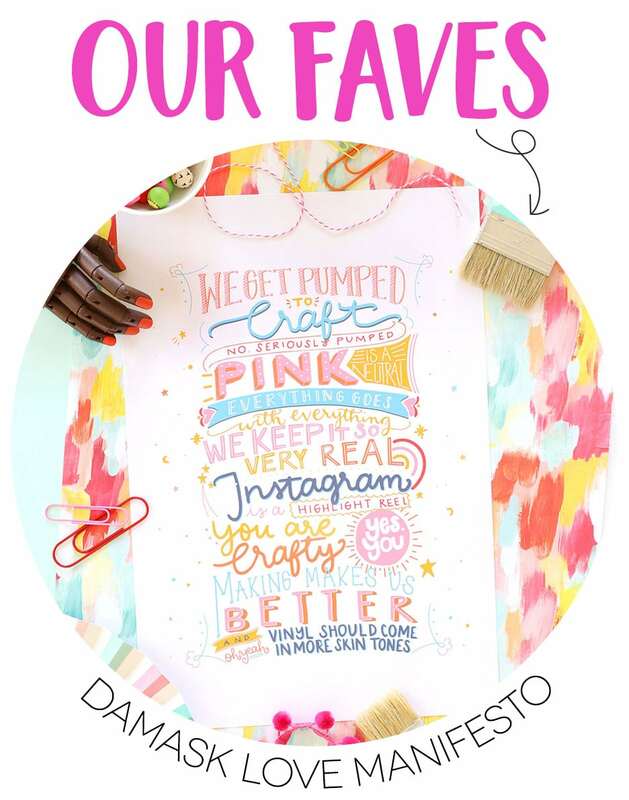 Such fun ideas here! The kiwi bead is my favorite! But I love this walk-through. Simple is best! Also you have the greatest smile, lady! Love these! 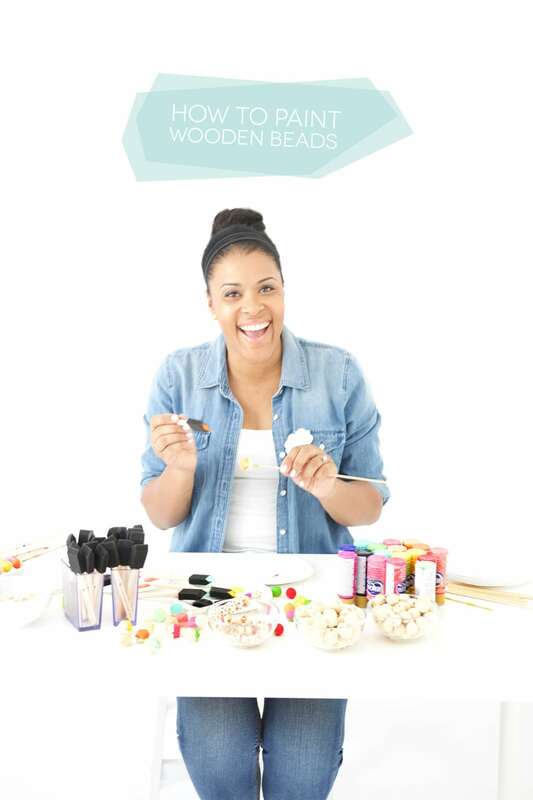 I have a question…do you ever sand the beads? I’ve been making wood bead necklaces for awhile and I’m having people tell me that some of them are snagging their clothes. The beads appear to be smooth but when I paint them sometimes they feel quite rough afterwards. 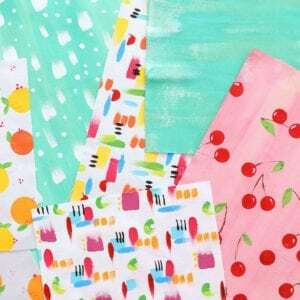 I’ve been using the Martha Stewart craft paints. I don’t sand them, but it could be a good idea to avoid any snagging. 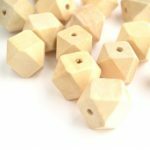 Also worth mentioning – I buy a lot of my beads from a shop on Etsy called Rock N Wood Supply and her beads seem to be really smooth when they arrive which may help with the snagging as well. 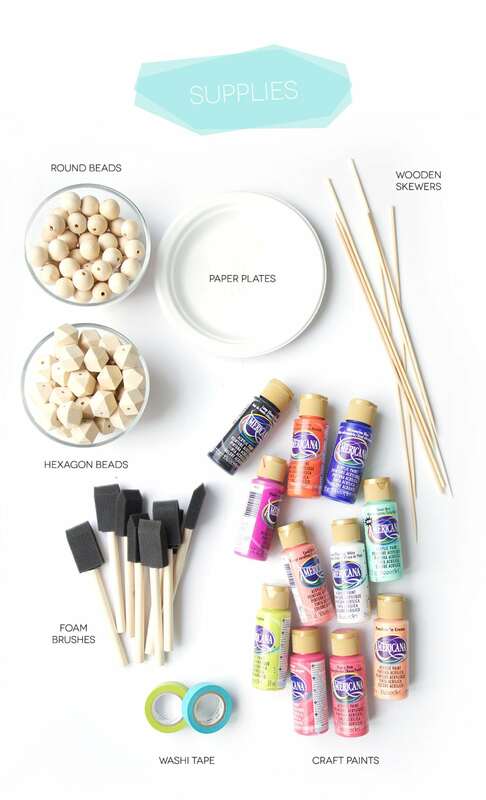 Can you spray paint your beads? Love your website and a great tutorial! I came upon your site while searching for info on painting wooden beads…I will be following your site from now on :-). I would be grateful for your input/suggestions. I was given bags of wooden beads that I would like to paint with acrylic craft paint and there appears (and feels) to be a clear coat finish of some sort on the beads. 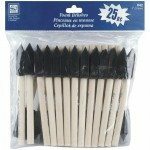 As a crafting newbie AND being frugal (respectful way to say “cheap”! Lol), I would like to use these beads instead of buying new unfinished ones. What would you recommend I do before to ensure that the paint adheres….sand, prime? Thanks so much for your help! 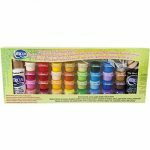 Do you protect your beads with any kind of sealant/protectant after you paint them? Thanks! The beads I purchased faded so I want to seal. What is the best way keeping in mind this is for a bracelet so next to skin. Thank you. 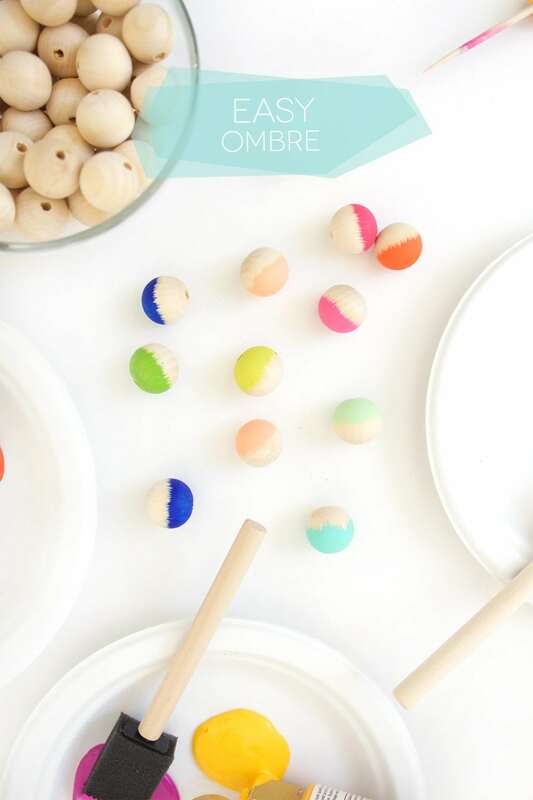 Can you spray paint your wooden beads?